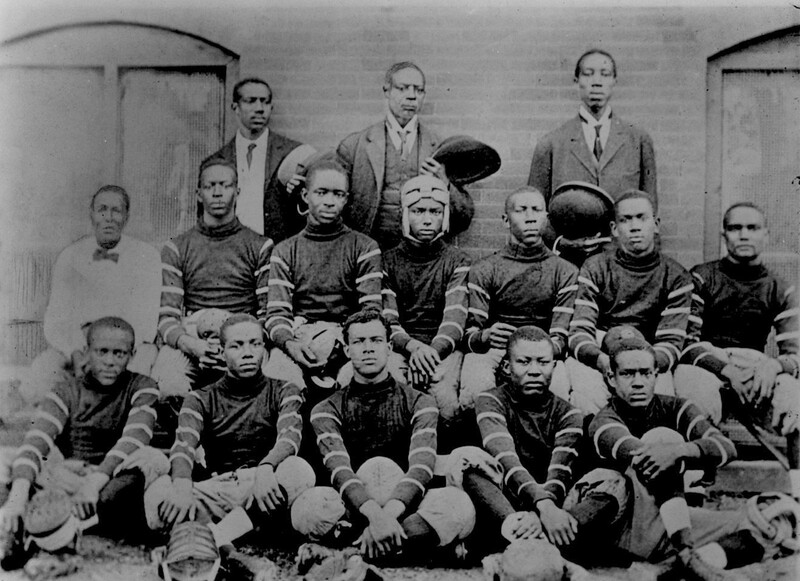 Great Dallas Historical Society photo described only as “a high school football team,” from 1909. The team most likely represented the “Colored High School” located at Hall and Cochran, the only high school in Dallas at the time for African-American students (it eventually merged with and relocated to the nearby Booker T. Washington High School in the early 1920s where, incredibly, it remained the city’s only high school for black students until Lincoln High School opened in South Dallas in 1939). As everything was segregated at the time, including schools and sports, the number of black high school football teams they could play was severely limited — in-town opponents were non-existent. In fact, a 1909 blurb in The Dallas Morning News announced that “[t]he football team of the Dallas Colored High School will play the Wylie University team from Marshall at Gaston Park” (DMN, Nov. 12, 1909). They were playing college teams. From 150 miles away. At least they were the home team. Photo from the J. L. Patton Collection, Dallas Historical Society.